Pokédex Entry "Thanks to its increased intelligence, scrapping over food is a thing of the past. A scratch from its claws will give you a case of frostbite!" Buck was born at Mt.Silver, right on the border of Kanto and Johto. A large clan of his kind lived there, and they were a pretty tight and loyal community. As a child, Buck was best friends with two other Sneasel, Norma Jean and her brother Zack. The three of them were troublemakers, often wandering away from their home to target Pokemon Trainers. Not to harm, but to thieve. The three Sneasel pick pocketed countless unaware humans as they traveled the region of Johto, stealing Nuggets, berries and even TMs. Quite a lot of the time they'd do it simply because they enjoyed it, not merely for what they could get out of it. Buck was the swiftest, Zack the bravest and Norma Jean the smartest. As a team, they were the very best ... apart from that one incident with the old lady and the frying pan. One summer, the trio traveled into Olivine City and saw a ferry bound for Unova. Deciding that a new region might have some new stuff for them to steal, they snuck aboard and enjoyed their journey helping themselves to food in the cargo hold. It was a long journey, and by the time they got to Unova something was very wrong. Stepping off the ferry in Castelia City, the massive place was nearly deserted. The three Sneasel were just as puzzled as the rest of the passengers, and it only got worse when a Sharpedo suddenly shot out of the water, tackled one of the humans to the ground and tore him to shreds. Chaos erupted as more diseased, red-eyed Pokemon burst out of the sea onto the jetty, savaging anything in their path. Blood and gore stained the ground. Norma Jean yelled at them to run, but an undead Feraligatr burst out of the water behind them, and seized Zack up in its massive jaws, killing him with a single, powerful bite. As Norma Jean screamed in grief for her brother, Buck took charge, grabbing his friend by the wrist and dragging her with him. More infected were appearing, not only from the water but from the city streets and buildings as well. They attempted to fight through the hordes, but were quickly overwhelmed. Seeing an opening, they made a final dash for it across Skyarrow Bridge and into Pinwheel Forest. They managed to live there in relative peace for a few days; it seemed that most of the undead were sticking to the cities for now. But as time went on, Buck became increasingly worried about Norma Jean. She was so much quieter than usual, and walked with a growing limp. When he asked her one morning if everything was all right, she showed him a bite mark on her ankle. One of the horde in the city had bitten her, and she was going to turn into one of them soon. Buck was devastated, refusing to believe that he was going to lose not one of his best friends, but both of them. He tried to look after her as she became increasingly lethargic, feeding her berries and cleaning the wound, somehow hoping that it might slow the process. But one night she took a turn for the worst, and asked Buck to stay with her in her final moments. After many slow and agonizing hours, Norma Jean's eyes finally closed. Buck let go of her claws, wondering how on earth he was going to build up the will to leave her. But at that moment, Norma Jean lashed out with a violent hiss, slashing him across the eye. He fled in terror, and didn't look back even once. Buck came across a rare Razor Claw during his wanderings around Unova and used it one night to evolve into Weavile. He met a group of survivors in Nuvema Town, but left with nothing but bad memories and the bitter taste of betrayal. More jaded than ever, Buck continues to wander, hoping to never have to pull any more daggers out of his back. 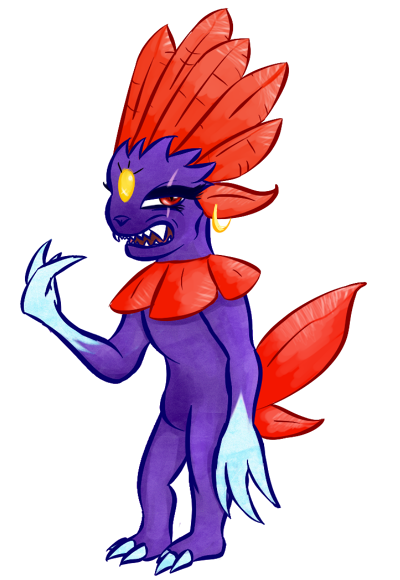 Appearance Buck is a normal Weavile apart from a scar across his left eye and a gold earring in his left ear. Personality Buck is selfish and cowardly, caring rarely for others besides himself. Striving only to meet his own needs, he will not hesitate to flee a battle if he is putting himself in danger, even if it means leaving others behind. However, he tries his very best not to do this, especially now that the epidemic has struck, and strives to become a better person, although he will not openly admit this to anybody. Buck is intelligent and remarkably cunning, relying on his speed and quick-thinking mind to succeed in what he does. He is a very experienced thief, and is able to take things right from other people's noses without them noticing ... most of the time. Currently he tries not to steal unless he really has to, and really doesn't like having to take invaluable things from fellow survivors, such as food. In any other case, however, he will take whatever he takes a fancy in. Usually, Buck very much prefers solitude over the company of others, but since the epidemic has started he has secretly wanted the company of others. Although he tells himself this is merely for his own protection, in truth he is very lonely after losing both of his lifelong friends and wants somebody he can put his trust in ... even if they end up fighting to the death while he hides in a tree. He is very private and doesn't like it when others try to snoop into his business. Since evolving, Buck has become a lot more self-centered and anti-social, distancing himself from everyone unless there is a good reason to converse with them. Deep inside he is hurt after what happened in Nuvema Town, and simply does not want to feel betrayed like that again so plays it same by firmly sticking to his own devices..